Lionel Asbo – a very violent but not very successful young criminal – is going about his morning duties in a London prison when he learns that he has just won GBP139,999,999.50 on the National Lottery. This is not necessarily good news for his ward and nephew, the orphaned Des Pepperdine, who still has reason to fear his uncle’s implacable vengeance. 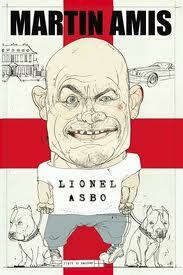 Savage, funny, and mysteriously poignant, “Lionel Asbo” is a modern fairy tale from one of the world’s great writers. I ummed and ahhed over buying this book. I caught Amis being interviewed by a rather sycophantic Runcie on TV and decided I liked the author. Make of that what you will. What put me off was the lottery win. It seemed a bit naff, somehow. I finally bit the bullet last weekend and I’m happy to say I loved it. I read it on Saturday and Sunday. It is full of wit and wisdom, made me laugh out loud many times. I know Amis has had mixed reviews. Some are concerned that he cannot possibly know anything of life in council blocks, but the thing that bugged me and made me wonder was the 42 year-old grandmother. Not that she was a gran at 42 – but that she wore pink fluffy slippers. Surely leopard skin nylon, Martin? Lionel Asbo gets a full 5* from me. Previous postWelcome – and win!